Much like a tornado, “The Wizard of Oz” landed at Salt Lake Community College’s South City Campus with a bang and a song on October 11th. It was the show’s “soft opening,” but you couldn’t tell by the size of the audience. A full house was packed literally to the rafters with those earnest to follow the yellow brick road. With good reason. To watch the show was to be swept away into another world and away from our hum-drum lives. “The Wonderful Wizard of Oz” is a novel by L. Frank Baum set during the turn of the century. Originally created to highlight key issues of his day, the book tells the coming-of-age story of a simple farm girl, Dorothy Gale. She is allowed to learn through her experiences in “another world” (a world which bears a striking resemblance to the home she left behind) the significance of exercising intelligence, having love for one another and holding tight to courage in the face of fear. But more than that, Dorothy learns the importance of standing up for what she believes in rather than running away from her problems. The novel was originally adapted for Broadway in 1902 and film in 1939 under the shortened title of “The Wizard of Oz.” Since then, the story of young Dorothy has caught the minds of young and old alike and the audience at South City Campus was no different. All one had to do was listen to the earnest strains of “Somewhere Over the Rainbow” to be instantly swept away to childhood memories, as an almost reverent hush filled the air. In a way it felt as though the audience was following the same journey as Dorothy, back to days when life was simpler and the important things of home, family and friends stood more clearly in our view. The set of “Oz” was sturdy and strong, a grey “brick” stair-framed platform which easily adapted to become a Kansas home, Munchkin land, The Wicked Witch’s castle and the Emerald City, all in a pinch. 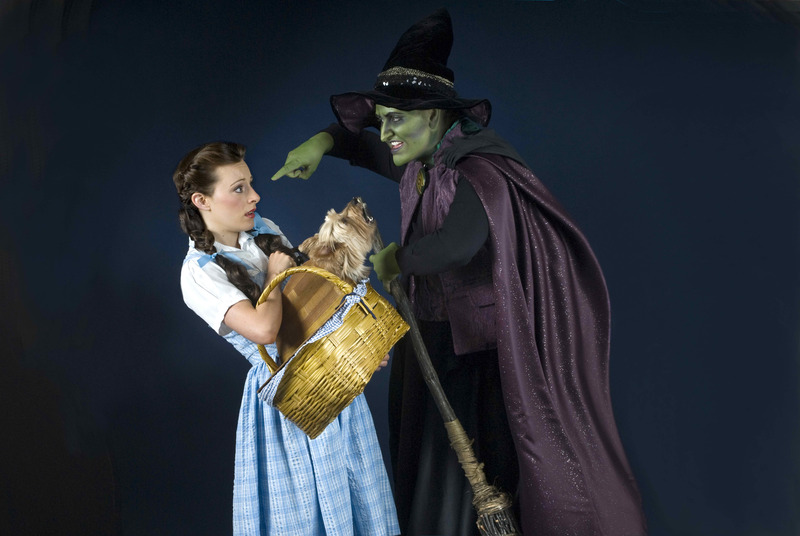 The costumes were colorful and full of cheer, with even the Witch’s outfit bearing a splash of vibrant green. The orchestra was wonderfully upbeat, pulling the story together. ASL interpreters were provided as well, playing the characters in turns as they conveyed the storyline. Kim Stephenson plays the curious, friendly and many times innocent Dorothy Gale, displaying a real talent for capturing the youthful spirit and accepting kindness that Dorothy is famous for. Nicholas Morris, Scott W. Butler and J. Michael Bailey play the dual roles of both the farmhands at the Gale farm and The Stuffed Scarecrow and The Hollow Tinman and The Cowardly Lion, respectively. These talented performers are entirely true to the characters, particularly during each of their scarecrow-tumbling, tin-kneed and tail-tugging introductory scenes. Then there’s a brilliant performance from Mary Anderson-Bailey as the arrogant, stuffy Miss Gultch and wickedly acidic Witch of the West, intent on stamping out Dorothy’s efforts amid a sea of boos and hisses. Aunt Em and Glinda of the North are represented by Kate Smith while Uncle Henry and The Guard of Oz are played by Kevin Cottam. Max Robinson, a longtime talent and member of the Actors’ Equity Association, also appears as the brilliantly inept Professor Marvel and The Wizard of Oz, pointing out in both parts that what Dorothy, and later her trio of companions, were searching for was already in their possession. Then there’s the sea of Munchkins, Ozians, Jitterbugs, Winkies and Flying Monkeys, without which the production would have never been a success. Filling the world of Oz with lively and memorable characters as if you knew each of them personally really brought the show to life. Truly, SLCC’s production of “The Wizard of Oz” is as enjoyable as the first time you saw it, but fresher and heartier in bold color and brilliant song and dance rather than the black and white of yesteryear. And Salt Lake Community College’s production was loved by all. To see show times or purchase tickets, visit http://the-grand.org/events or http://the-grand.org/2011-07-11-07-02-04/single-tickets. Students of Salt Lake Community College can get a discount by providing your OneCard.